... or buy from independent bookstores everywhere. Lucy’s life is perfect and she doesn’t want to change a thing, but when she comes back from summer vacation she realizes that her best friend Ella has been doing a whole lot of changing and the girls don’t seem to have anything in common anymore. Worst of all Ella has stopped believing in magic, just as Lucy is sure she has seen a gnome in her cupboard! And when Lucy’s mother announces she is going to have another baby, it is more change than Lucy can cope with. She is convinced her parents don’t want her anymore. It takes the help of Chloe, a free spirited teenager who lives next door, to show Lucy that there is indeed magic in the world, and that even when your whole life seems to be falling apart, change can actually be good thing! 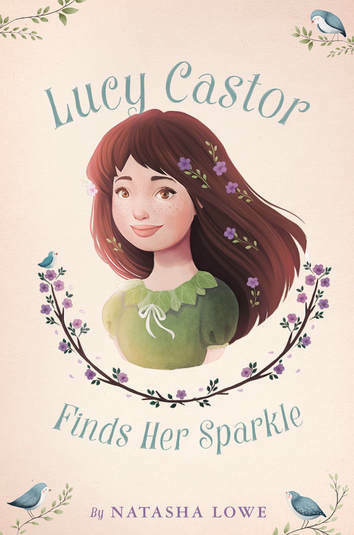 STARRED REVIEW "This is a feel-good story that draws the reader into the magic and the changes of Lucy’s life in a way that is impossible to put down, the words flowing with an irresistible beauty...Highly recommended." School Library Connection. "It’s the summer before fourth grade, and Lucy is encountering unwelcome changes. Her former best friend has stopped believing in magic and become a “Sparkle Girl,” hanging out with a new group of girls; her grumpy neighbor has put up a sun-blocking fence; and, worst of all, her mom has announced that she’s pregnant—with twins. But with the help of her supportive parents, a new friend at school, and a teenage neighbor, Lucy learns to embrace change as its own kind of magic. A few scattered Briticisms and an overall nostalgic tone make this a cozy read... this quiet, almost timeless tale may appeal to young readers who are similarly resistant to growing up." School Library Journal.